Why Take JB to Gemas KTM Train? Locals and tourists usually take KTM train from Johor Bahru (JB) to Gemas to connect to the ETS services going to the north of Malaysia. In fact, Gemas is not a tourist attraction. However, the train station in Gemas is the interchange station between KTM service and ETS service in Malaysia. Shuttle train from Singapore will stop in JB Sentral and passengers will have to take KTM service to Gemas. After the stop in Gemas, KTM service will then proceed to go to the eastern part of Peninsular Malaysia. Meanwhile, for those who change train from KTM service to ETS service will go to the west and northern part of Peninsular Malaysia. Click to view KTM Intercity schedule from JB to Gemas, released on 18 December 2017. JB Sentral is one of the transportation hubs especially for train in Johor Bahru. In fact, JB Sentral connects Malaysia and Singapore with a 5 minutes shuttle train service between JB Sentral and Woodland CIQ. Therefore, many tourists and especially working adults would travel back and forth between these two train stations. 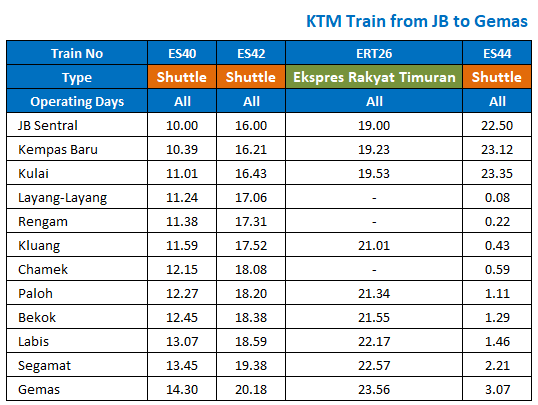 On weekends or public holidays, those who comes from other parts of Malaysia would then take KTM Intercity train from JB to Gemas to access the ETS service to go back to their hometown. Gemas Train Station is the interchange station for KTM Intercity and ETS service. The train station is located in Negeri Sembilan. Passengers going to the west and northern areas of Peninsular Malaysia such as Kuala Lumpur, Ipoh, Butterworth and Padang Besar by train should exchange train and take the ETS service. ETS tickets can be bought at the counter or online at BusOnlineTicket.com. There are toilets on-board in each coach for the convenience of the passengers. The seats are cushioned to ensure a comfortable journey for all passengers. The trains also have air-conditioner so passengers would not have to worry about the hot weather in Malaysia. Plan your trips and book your JB to Gemas KTM train ticket online to ensure that you secured your tickets before your journey. Since KTM train from JB to Gemas is one of the popular train routes in Malaysia, the train tickets might be sold out fast especially during festive seasons. Booking KTM train tickets online is easy with BusOnlineTicket.com. Our mobile friendly website and various payment options make the booking process easy for our customers. 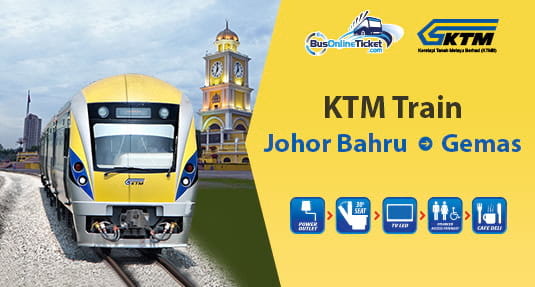 Easily Book KTM Train Tickets from JB to Gemas Online Now!